He says when he assumed office in March 2017, debt-ridden farmers were committing suicides and Uttar Pradesh had become "synonymous with murder, loot and riots"
Chief Minister Yogi Adityanath asserted Tuesday his government has changed the image of Uttar Pradesh and the state's law and order has become a model for the country as not one incident of rioting happened under his watch. Presenting a report card on the completion of two years of his government, he said when he assumed office in March 2017, debt-ridden farmers were committing suicides and Uttar Pradesh had become "synonymous with murder, loot and riots." "Mafia was looting the state's resources under political patronage. Mafia was rampant in SP, BSP rule," he alleged. "There was a long era of scams." Adityanath said he has changed the "perception about the state" and improved its "tarnished image". The better atmosphere has become a "nazeer" (model) for the country, he said. Hitting out at previous state governments, he said, "In 2012, there were 227 major communal riots. In 2013, there were 247 such riots. In 2014, there were 242 riots. And 219 riots in 2015 and more than 100 in 2016, in which properties worth crores were lost." "However during the BJP government, not a single riot took place. Nor were there any incident of acid attacks or kidnapping," he claimed. Though there has been no major communal violence in Uttar Pradesh during the past two years, a mob of 400 people, including right-wing activists, had fought pitched battles with police in Bulandshahr district in December last year. The violence in the district's Siana area broke out apparently after right-wing activists were angered by the discovery of cow carcasses strewn in a nearby jungle. In January last year, a 22-year-old youth was shot dead during a "Tiranga Yatra" by some people after which a series of violent incidents and arsoning had rocked Kasganj. Taking lesson from it, the state government that year denied permission for any such procession in the western Uttar Pradesh city on Independence Day. 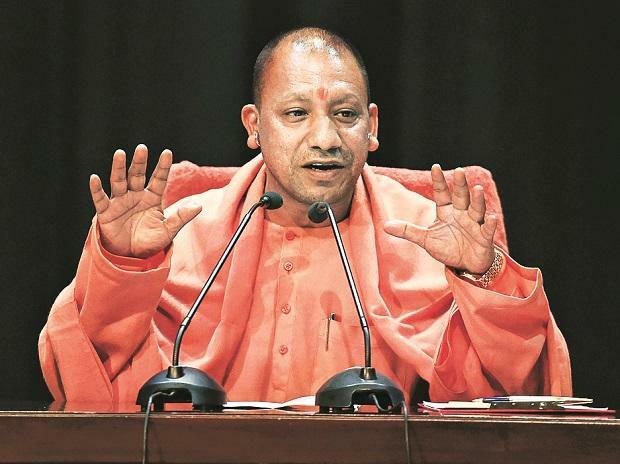 On Tuesday, at his press conference in Lucknow, Adityanath cited the reported exodus of Hindus in 2017 from Kairana, another city in western UP, "due to anarchic forces". "However", he said, "today, peace has returned as well as the traders who had fled from there." The exodus of Hindus from Kairana was a major poll issue for BJP in the 2017 assembly election in Uttar Pradesh. The chief minister said the confidence of the state police force has gone up and there is no interference from his government in their functioning. "There is zero tolerance for crime and criminals and 73 criminals have been killed in 3,300 police encounters. Over 8,000 criminals were arrested, while 1,000 were injured. Unfortunately, half-a-dozen police jawans also attained martyrdom in the encounters," he said. Adityanath also said that the UP Sthaapnaa Diwas (Foundation Day) was celebrated for first time after 68 years in 2018. The chief minister said the state had received investment proposals worth Rs 5 lakh crore, of which Rs 1.5 lakh crore has already been invested. "In the past two years, investments done in the state are more than the combined amount of SP and BSP governments. Under the BSP dispensation, the investment figure was Rs 56,000 crore and during the SP rule, it was Rs 77,000 crore," he said. Adityanath also attacked the Congress, which has been out of power in the state for nearly 30 years. "Congress ruled the state for the maximum time, and gave it the title of BIMARU state. The people of the state wanted to shed the BIMARU tag, but after 1990, during SP rule (4 times) and BSP rule (3 times), the state entered into an era of anarchy and lawlessness." BIMARU is an acronym that denoted the states Bihar, Madhya Pradesh, Rajasthan and Uttar Pradesh with low levels of development index. The chief minister also listed achievements and welfare schemes of his government. His deputies Keshav Prasad Maurya and Dinesh Sharma and Uttar Pradesh BJP chief Mahendra Nath Pandey were present at the press conference.